Imagine you and your team members are standing in a circle, facing each other. Now, imagine a facilitator standing in the middle of the circle, asking you to change anything at all about your appearance – or at least anything doable in the next five minutes. What would you change, and why? Chances are, you can probably think of a couple of ways to do that, but you’ll probably think twice about actually doing it if your bosses are part of the circle, or if you don’t want to do it because it’s not normal in your team, or if you’re a relatively new team member. if that’s the case, then you’re not alone. The activity in the opening paragraph is one that we use to open our Unleash Your Creativity Workshop. Given that we greatly encourage our participants to be as silly and adventurous as they can, you would expect them to come up with the craziest ideas, but the response we get (even across different business sectors) is often less than enthusiastic: They would first meet our challenge with a long, hesitant silence, and then, only after a few more rounds of encouragement on our part, they would begin casting bewildered looks at each other, as if waiting for someone to initiate or asking permission to engage in the activity. This is a simple example, but one that we use to illustrate a powerful point: Creativity is often hindered by fear – namely, the fear of violating the group’s norms, and the fear of the corresponding social judgment. There are, of course, other factors that hinder creativity. There’s the mindset that “I’m just not naturally creative,” or the attitude that “I’m in corporate I.T., not advertising, so I don’t have to be creative” (both of which we will discuss in different posts). These mindsets assume that given the right “creative” personality traits and given a certain “creative” profession – say, painting, as being creative is usually associated with the fine arts – one can naturally generate creative ideas. But this is a myth. 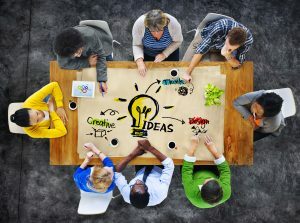 Even the most “creative” person will not be able to come up with new, interesting ideas if placed in a room full of stiff-necked executives. And it is this reason that this fear is particularly significant: it plays a vital role in cutting creativity off, and yet it’s most often overlooked and underacknowledged. In other words, we at Convergent Experience believe that creativity is not so much personality-based or profession-based, but rather context-based. Any organization, then, should strive to kill this fear and inhibition, and cultivate a culture of creativity. But how, exactly, does one do that? Here, we present practical ways based on research and our experience that can help you build a culture that stimulates creativity. In his article “2 Keys to Boosting Team Performance,” our Training Consultant Kit Ycasiano introduced the concept of psychological safety, coined by Harvard psychologist Amy Edmondson. Psychological safety is defined as the “shared belief that the team is safe for interpersonal risk taking,” Edmondson wrote in her landmark research paper Psychological Safety and Learning Behavior in Work Teams. In psychologically safe teams, members feel that they are accepted and respected, and that they won’t be belittled or judged when they present their ideas to their teams or leaders. There are many ways to establish psychological safety in your team, but two important ways to do so in the context of stimulating creativity is to build trust and open communication, and to celebrate failure. These may seem self-evident, but we have a few suggestions on how you can behaviorally apply these two concepts. Remove fear. If you are the leader of a new team, or a team that is unused to voicing their opinions to authority figures, it will help to explicitly tell your team members that they shouldn’t be scared to share their ideas, and that all ideas will be valued equally. You can introduce the concept of psychological safety and assure them that your discussion is a safe space for them to speak their mind. Include everyone in the conversation. Make sure that everyone has the opportunity to speak, and take extra effort to include those who don’t normally speak up in meetings, especially those in positions with less power. Filipinos are particularly reticent because of the way our culture venerates those in authority, so persevere in drawing them out. It will take time and repeated encouragement for them to gain confidence. Maintain a nonjudgmental stance. Even if you strongly agree or disagree with an idea, refrain from interrupting the person speaking until everyone has shared their ideas. Admit to your own mistakes. People are unwilling to admit their mistakes to a leader or team members who perceive themselves to be above mistakes, or who blame their mistakes on others. Especially if you are in a leadership position, be willing to be vulnerable to your team, and you will see them opening up to you as well. Creativity is not just something “nice to have” in knowledge organizations – in the current landscape of rapid change and globalization, creativity is crucial to the survival of an organization. Incorporating these practices in your team and seeking to establish them as the norm are vital in helping you thrive in today’s changing global landscape. Edmondson, A. (1999). Psychological Safety and Learning Behavior in Work Teams. Administrative Science Quarterly, 44(2), 350–383. Edmondson, A. (1999). Psychological Safety and Learning Behavior in Work Teams. Administrative Science Quarterly, 44(2), 350–383. Martins, E.C. & Terblanche, F. (2003). Building organisational culture that stimulates creativity and innovation. European Journal of Innovation Management, 6(1), 64-74.